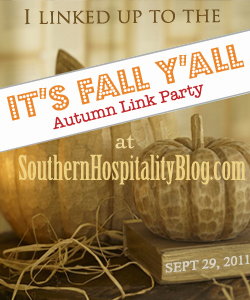 Although my front porch isn’t quite done yet, I couldn’t resist joining in on Rhoda’s fall front door party. I found the urns at Lowes and placed my cute yarn wreath on the front door. So far I’m loving it! Happy Fall Y’all! Your doorway is reflective of the homeowners — friendly, inviting, welcoming. So glad you found some urns you liked! Your porch looks great! 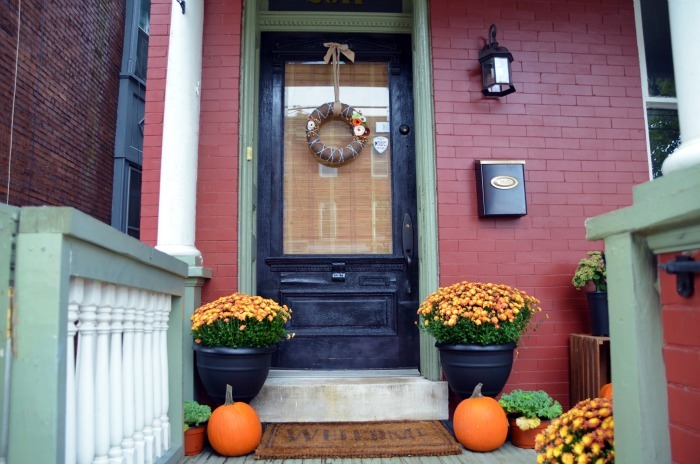 I’m a real sucker for Fall front porches! It’s gorg! I love your little wreath. It adds the perfect touch of color to your door. Isn’t it crazy how we all love spring/summer flowers when summer is here, and then when fall hits, we break out the mums. They are lovely. Everything looks so cute, Beth! Love your wreath!! Gorgeous! 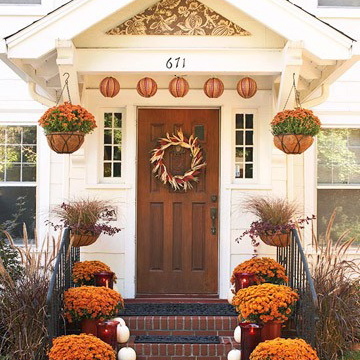 To me, nothing says fall like a gorgeous yarn wreath and mums! Love it all! Very cheerful–what a warm welcome! Your yarn wreath goes beautifully with your mums and pumpkins yet hints at what’s inside. Did the sun come out for you, or have you had to resolve to be cheerful and take good photos despite the clouds?